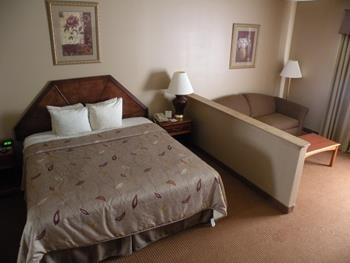 The Best Western Diamond Bar Hotel & Suites is ideally located in the center of Diamond Bar. Come and experience our hotel near the major tourist attractions. Best price guaranteed and exclusive deals. 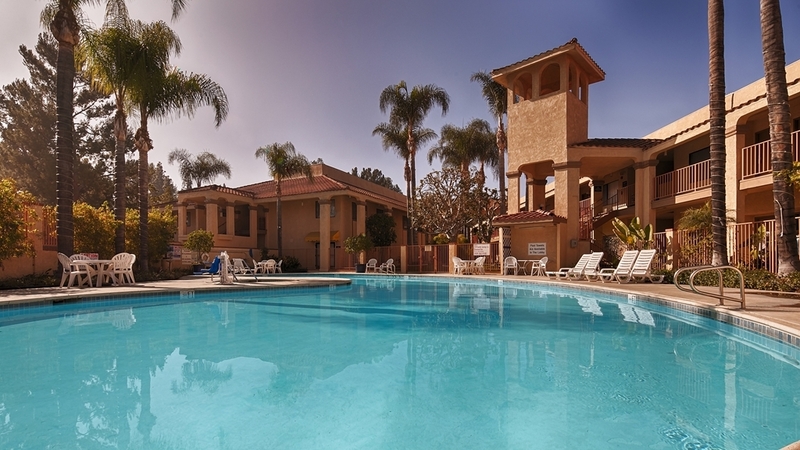 Stay at this Diamond Bar, California hotel, offering an oasis of serenity in a beautiful resort-style setting. 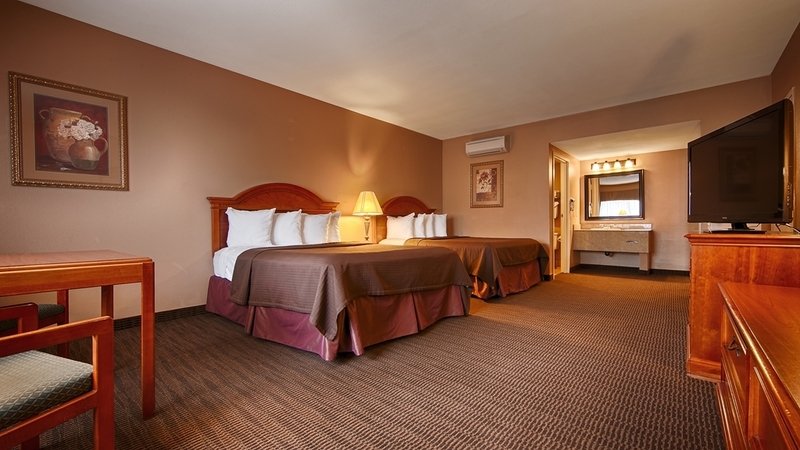 The Best Western Diamond Bar Hotel & Suites is conveniently located to California's Pomona Fairplex and the Los Angeles County Fairgrounds. Hotel guests have easy access to the California Polytechnic University, Mt. SAC College and other major southern California attractions including Disneyland®, Raging water, NHRA, LA Rooster Road Show, Antique Car Swap meet and Knott’s Berry Farm®. Complete with a Japanese garden, pool and spa, this lovely hotel offers a choice of business, family or suite. 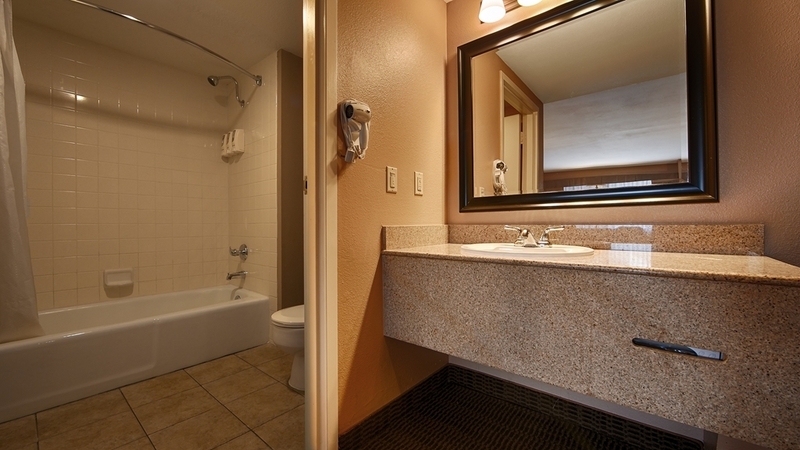 All rooms are equipped with thoughtful amenities needed to make any stay enjoyable. 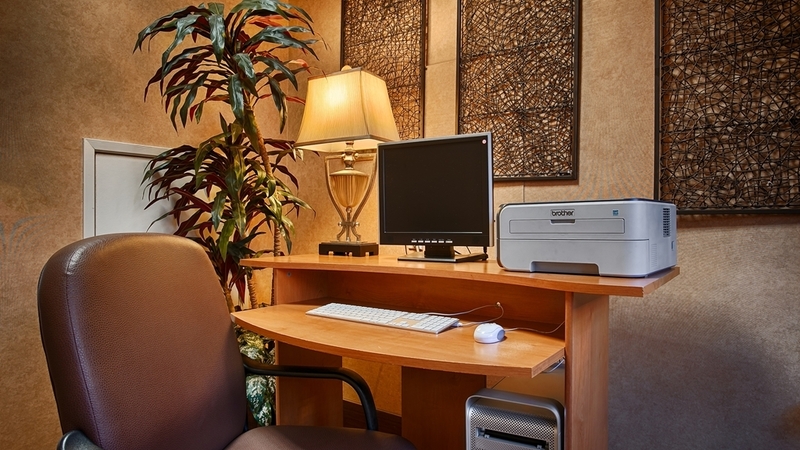 Guests can enjoy complimentary deluxe continental breakfast and executive-style business center. This southern California hotel has earned the Best Western International award for professionalism and commitment to hotel guests. 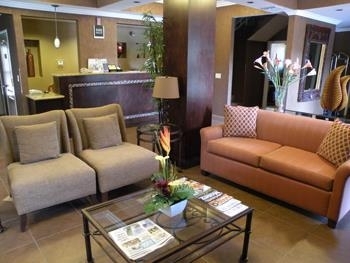 Make your reservation today at the Best Western Diamond Bar Hotel & Suites in Diamond Bar, California! Please note the spa and pool will be undergoing maintenance and will be closed from February 15 to April 30, 2019. We apologize for any inconvenience. "Great location! Room smelled! Smoke Alarm chripping"
I stood here due to the Swim Meet Mt. Sac was hosting and my daughter and her teammates all stood here. Check in was EASY! The women who checked me in was very polite. I was in Room 157 as soon as I walked in there was a smell like a wet smell so I opened the window to air out the room to hope that would help. Plus I was only going to be in the room to sleep since I was going to be at the college. Second issue is obviously the hotel is smoke free the issue was the trash can where smokers can put ou their cigarettes was right next to my room. Guess what someone smoked in that area and smoke lingered into the room. Then as Today, March 17th is my last night at 6:35AM the smoke alarm starts CHIRPING!! I'm a light sleeper so there goes my sleep! I went to my daughters team makes rooms to see if their room had that odd smell NOPE! See if they could smell smoke from cigarettes NOPE! It was the worst experience I've had at a Best Western! I won't be staying there again!! Advise I would give management MOVE THE TRASH CAN WHERE SMOKERS PUT THEIR CIGARETTES OUT FAR AWAY FROM THE ROOMS!! PrisDLC, Thank you for bringing to our attention your experience and comments regarding your stay in our hotel. Unfortunately, despite our efforts to ensure that nobody smokes in non-smoking rooms, it does occasionally happen and I hope you'll accept our sincerest apologies for the smell of smoke that you experienced. I am very sorry for the impression we left you with, and we hope you will return to experience our continuing improvements. Good size room with plenty of amenities. Breakfast is not expansive but is decent. Coffee is good. Very close to restaurants and shopping. Need to get corners clean and pay attention to details. Staff is helpful and friendly. djnix2403, Thank you so much for sharing your review and giving us an honest look at the guest experience in our hotel. We are happy to hear that you found our location to be so convenient while staying with us near at the restaurants , stores and that you enjoyed our staffs hospitality that we strive to show to each guest, during every stay. We are all looking forward to seeing you again! Jet27569966726, Thank you so much for your compliments to our free breakfast service! It is very rewarding to hear from you on this matter and we appreciate that you have acknowledged our efforts to provide a clean, comfortable, and hospitable experience. We're glad you had a great time with us and we look forward to serving you again. "Needs a Little (but only a little) Bit of Love"
The Hotel, for the most part, is in good shape, but is in the need of a little bit of law. I stayed for a week and it was fine. Not fancy, but sufficient for business purposes. The small issues included: 1. Parking Lot lights that were one at 4 am, but off at 6 am, even though it was still dark at 6 am. 2. Plastic wrap/bag covering the smoke detector in the room. 3. Rumpled, although likely clean, covers on the beds. But the pluses also included: 1. Very good internet 2. Washing machines for guests that worked and could be paid for without coins (and reasonably priced). They supported a phone Ap which could be downloaded and used to pay for the machines. It worked well 3. Decent quite level considering location next to Pamona Freeway. David C, Thank you so much for taking the time to write this thorough and insightful review. We appreciate that you've taken the time to share the ways that we have impressed you and the ways that we can improve.I do apologize for the parking lot lights, bed sheets and your suggestions are certainly going to be taken into consideration as we are always seeking ways to improve upon the guest experience. Please keep us in mind for your next stay in the area. The room was big and clean, bed was comfortable and everything seemed great until I woke up to a roach next to my bed. Breakfast was not as good as most best westerns we've stayed at but it was edible. Wordenwifey, Thank you so much for alerting us right away to the pest in your room. Further, any issue related to insects is promptly addressed through professional treatments right away. I am sorry to hear also that you did not thoroughly enjoy the breakfast service,, but I'm glad we were able to meet your expectations of cleanliness and providing you a comfortable bed. We are working to improve upon the guest experience and I hope you will remember our attributes and return to see how we have improved to impress you even more. Check in/out process took way too long, holes in towels and sheets, no change available if needing to use the provided laundry facilities and book 2 queens and was given 2 doubles and then was told at the desk that they do not even have queens. Definitely would not stay again and I would recommend that other choose another location as well. JBella282, I apologize that you had a long wait at the desk and thank you for your patience. Also, Your comments regarding the towels, sheets will help us to recognize our strengths and improve upon our weaknesses. I hope that you will give us another chance to change your opinion and make your stay enjoyable. "110 USD motel or hotel?" 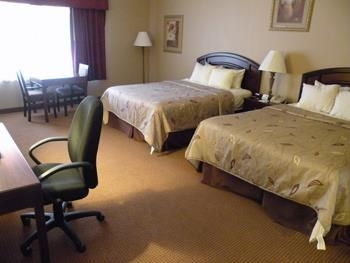 SERVICE: Efficient and friendly ROOM: very low quality RATIO QUALITY/PRICE: claiming to be a hotel but looked and felt more like a motel in my opinion, basic room with no interior design, old furniture, dated carpet. Lingering smell. Breakfast was basic at best with very limited variety. Piero We appreciate the time you have taken to bring to our attention your feedback with regards to our staff and bed. We hope that you will return as it is our ongoing goal to surpass expectations of service and accommodations. "Best western. 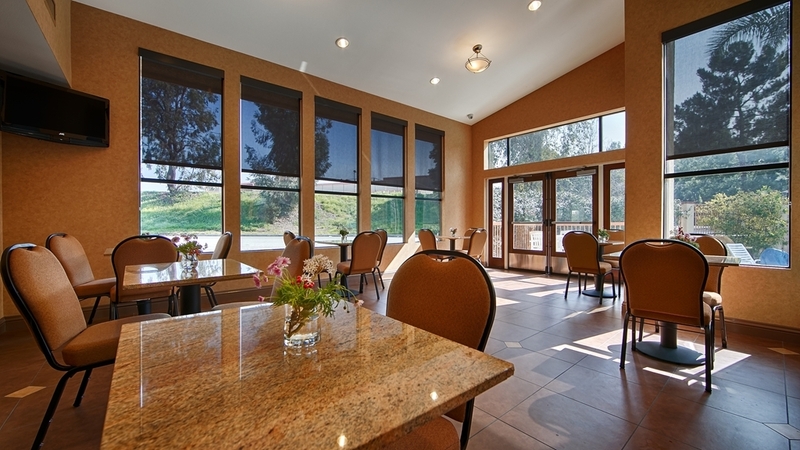 Diamond Bar, CA"
Friendly staff, breakfast was delicious!! The rooms are a little outdated and too dark for my liking with the decor. Wish the rooms were a little more modern and without carpet, But overall good place to stay. bvaldez1 I am happy that we met most of your needs and appreciate that you also let us know the areas that we can continue to improve upon. Your feedback is helpful, and we can benefit from your perspective of our accommodations, hospitality, and services. We are always looking for ways to improve upon the guest experience and I hope you will return to see how we continue to grow and evolve. It is near a shopping center with clothing, pharmacy, fast food and even hardware close to hand. Near intersection of freeways but noise was not a factor. Pleasant personnel made stay delightful. Elevator was great to not have to climb stairs. Fred U Thank you for sharing how you have enjoyed our friendly hospitality and accommodations. I am thrilled to know we have met your expectations and to know our location worked well for your plans. We are very happy to learn that your stay was so peaceful, and we hope to see you again. "Perfect spot for business travel"
This is an ideal location for my business travel and the internet is strong enough to satisfy my requirements. I have stayed at this location a handful of times and will again soon, no doubt. 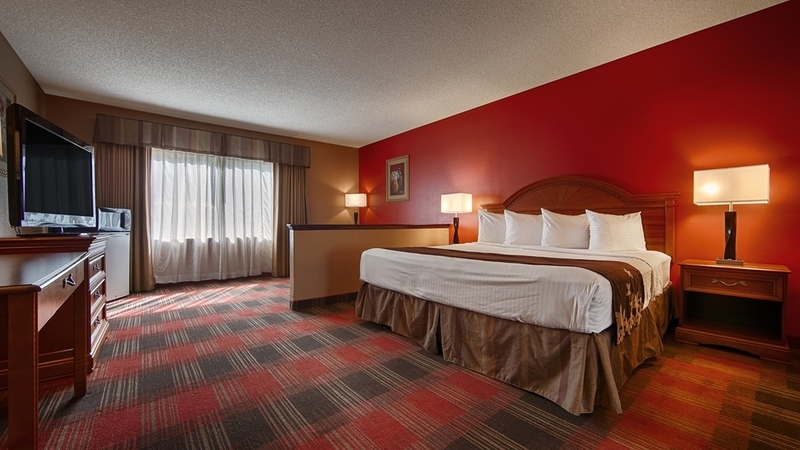 Extremely friendly and helpful staff, comfortable rooms, ample parking, and overall five-star worthy for my needs. jdparenti, We can't thank you enough for your five star rating at the Best Western Diamond Bar Hotel & Suites hotel. We are so glad to hear from you and to learn that we were able to give you a pleasant, comfortable and convenient experience while staying at our hotel near at your business travel. We will happily share your comments with our staff and we look forward to seeing you soon! "Make sure room 216 does not have bedbugs"
At first I felt very happy that I booked this hotel: perfect location and the room has everything I need. But we learned it in a hard way that this room is far from perfect: my kid and I woke up by constant itching all over our body around 1-2am. I found and killed a couple of bugs on my bed and when I saw fresh blood spilled out of their bodies, I know something is not right. I brought one of the bug bodies to the front desk and the front desk staff immediately confirmed it is a bedbug. He was courteous and acted quickly to give me access to another room (142) and when requested, he also provided me a plastic bag for sealing my clothes. Moving, with my very sleepy teen, at this crazy hour was not pleasant but what could I do? When asked if this issue was known, he mentioned it is unknown but obviously somebody else also complained of the same issue during the same night :(. The next morning, I went to the front desk asking for another plastic bags and I mentioned the bedbug issue to explain my request. This time a female staff (she checked me in on the previous afternoon) simply told me they will check the room. No apology was offered and it seemed she just wanted to dismiss me asap. FarAway567992, Thank you for bringing to our attention your experience and comments regarding your stay in our hotel. The room was thoroughly inspected the next morning and no bugs were found and also the room was rented out, with no further bug complaints. I want to assure you that we are thoroughly investigating this claim and that although we have not found any evidence of a bug infestation, we are taking the necessary precautions to ensure that nothing is missed. I want to assure you that we respond promptly to pest alerts with expert extermination services and also treat to deter pests on a regular scheduled basis. "Good bargain, freeway accessible, decent neighborhood"
An affordable place to lodge in L.A., clean, easy to get on the freeways, free breakfast. Ask for a pet-free room unless you don't mind flea bites (my only major complaint). Dark decor of my room overpowered the light bulbs so it seemed quite dim and gloomy in the room, but I was there to sleep mostly. Being next to the freeway, there 's a lot of ambient traffic noise outslde but my room was sound proof so I was nice and quiet indoors--but that means it's EZ to get on the freeway. vincentw498 Your review and rating are greatly appreciated; though it is very disappointing to learn of the bad impression we made during your recent stay. We are forever working to improve upon the guest experience and I hope you will remember our attributes for when you return during another trip to the area to see how we have improved to impress you even more. "Better off at a Motel 6"
Would like to give it a 0 star. Worst customer service ever. Didn't receive recognition for being a Platinum Member. A PLATINUM, LOYAL MEMBER. Guy that checked me in CANCELLED and rebooked my room because we used my sisters credit card card for the incidental. His reason? Cause I didn't pay for the room? WHAT DIFFERENCE WOULD IT HAVE MADE IF I PAID CASH? I paid for the whole room btw. Wouldn't put my name on the reservation so I couldn't claim my points. Got upset and started raising his voice cause I WTF to my sister. I used to work at the Front Desk of a Best Western for 5 years. TRAINED front desk personnel, answered and responded to all reviews and customer care, ACTIVE MANAGER ON DUTY. 1, you don't treat guest like that. 2, you don't work at the front desk with out automatically understanding the people you check in are on VACATION and probably had a long day of traveling. Yeah, I'd never stay here again. Nor would I recommend. It's crap service, anybody that claims otherwise is lying. I cut my stay a day and risked being without a place to stay on a weekend everywhere was pretty much sold out cause of the music festival going on, just because this place left a nasty, sour a** taste in my mouth. You're better off staying at a Motel 6. From the moment I booked this room to the moment we decided to cut out stay, it has to be hands down the worst decision. Asia, Thank you for bringing to our attention your experience and comments regarding your stay in our hotel. We take this very seriously and are very sorry about the issues you faced; this has been forwarded to management. Thank you again for sharing and we hope to earn your business in the future by continuing to evolve and improve guest experience. "bugs and inflexible check-in staff"
Check In we stay at Best Western Diamond Bar to attend my nephew's wedding. My sister insisted on paying for the hotel stay, so she came by and paid for it with her credit card few days before. When we arrive around 12:30 p.m., we ask if it is possible to check in, the lady at the check in, without even looking up, point to the "check in" sign and said "check in is at 3:00 p.m.". I ask if she can check to see if there's any room available, she then reluctantly check our reservation. During the almost 2 hours wait time, we asked her a few times if there's any room available, one time, she told me the housekeeper is at lunch break, she can't find out, another time, she told us her shift is almost over and she is busy so she can't help us. When she is finally free and the housekeeper came back from her break, we ask if there's any room available (by then it's almost 2:30 p.m.), she then said, our specific room is not ready yet, when we ask if there's other similar room that's available, she said she can't give it to us, because my sister prepaid our room so she can't give us another room. After arguing with her, she then gave in and give us the other similar room that's been cleaned. Before she gave us the keys, she needed a credit card for damage deposit, we tried to give her our credit card but she won't take it. she wanted my sister's (who wasn't with us) credit card. We told her to take our credit card for the damage deposit and then she read off the note from her manager and said she can't take our credit card, it has to be my sister's credit card. We told her my sister is not coming to the hotel. She is very busy with her son's wedding and there's really no reason why they can't take our credit card (other than a note from her manager with no explanation) Again, after a long argument, she reluctantly took our credit card. When we got back to the lobby after we check in to our room, we found the lobby to be very hot and the lobby door was open (it was nice and cool before). By then the manager of the hotel was on shift so he had turn off the air condition and open the door in the middle of the hot hot day! That's when I realized the culture of this hotel is not to keep the customer happy, but to do whatever it can to save money. The Room Air condition was situated in a way that it's cold air blows right at our bed and specifically, our pillows area. Tried many ways to change it and finally gave up and turn it off because I don't want to wake up with a headache. To top it off, the next morning when I took the shower, I found bugs crawling in the bathroom. Dear jenny154943, Thank you for bringing to our attention your experience and comments regarding your stay in our hotel. We appreciate you taking the time to share this experience and we do apologize for the inconvenience this might have caused you. Our main goal is to serve our guests above and beyond and satisfy them during their stay but it is saddening to learn that your expectations weren't met. You are welcome to contact us at the Hotel, should you have any other concerns about your stay. We hope that you would consider us again in the future so we may change your views about our hotel and management. I have waited a couple weeks to get home to review this hotel. I was EXTREMELY mad when I checked in and I was asked for 3 ID's. Credit Card with picture, Driver's License and AAA card for discount I booked. After staying at about 10 hotels this past couple weeks this was the first one that asked for everything. I can live with that. But what topped it off was that the front desk person wanted to make a photo copy of all the ID's. WHAT? NO WAY!!! He said that a copy is needed because the credit card companies no longer used raised print on the credit card. What ridiculous excuse is that? I once had a brand new credit card issued and it was used once at a hotel. The next day there were 6 tickets charged at Six Flags. As a victim of fraud there is NO valid reason to copy someone's ID. NO REASON! I am a Diamond level reward member at Best Western. Not a criminal. If the hotel has a fraud problem or is suspicious then that isn't my problem. I am a guest. The hotel has potential to get a better grade. Recognize premium rewards customers! Give upgrades and be more welcoming at check in. Be a Best Western hotel. 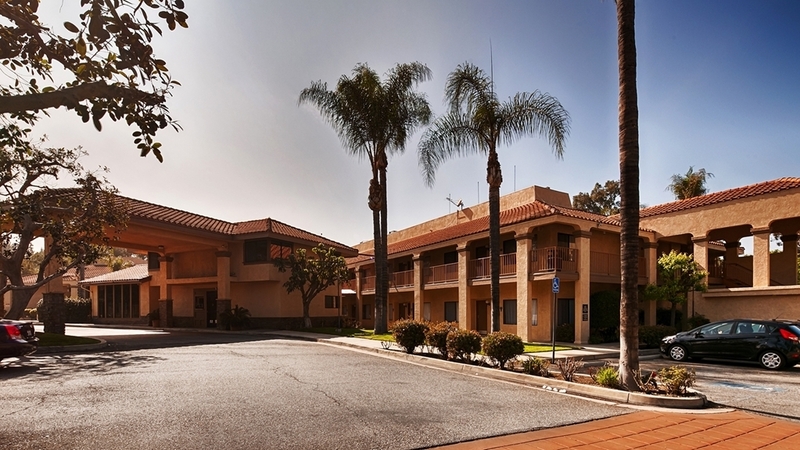 DRGSEA, Thank you so much for your thorough review of our hotel's policies, layout, and accommodations of Best Western Diamond Bar Hotel & Suites Hotel. Your comfort and convenience is our top priority and we are addressing your comments with our staff and re-evaluating our guest service policies to ensure that a similar situation does not occur in the future. We sincerely hope that we may be given a chance to change your perception of our hotel in the future. My experience was disappointing. The surrounding noise and the uncomfortable bed did not allow to have a good night sleep with my husband. The coach in the living room had stains and it has a bad smell...Someone was smoking and the smoke was entering the room( my husband and I do not smoke)and we were not able to enjoy our time watching TV. Dear sandybristo, We are sorry to hear that your stay & experience was unpleasant. We do our very best to ensure our rooms & equipment are thoroughly cleaned and maintained. Thank you for bringing this misstep to our attention, as it helps us to improve. We hope you will give us another chance should you return to the area. "Do not have good sleep"
Its clean, staff are helpful. Bed is comfortable but pillow is a small square cushion, if you turn/move during your sleep, your head will drop to the mattress away from the cushion (pillow). I did not sleep well but need to drive the next day to my destination!! We appreciate the time you have taken to bring to our attention your feedback with regards to our staff and bed. We hope that you will return as it is our ongoing goal to surpass expectations of service and accommodations. "Clean and Big Rooms Good Price"
I like coming to this hotel because the rooms are always clean and so big for all my junk. I travel heavy and l like that there is plenty of space for all my stuff. The price is perfect for me as well and enjoy coming back here again and again. We are always striving to improve our offerings and that is why your input is so important. Thank you for sharing your experience and comments pertaining to our price. On behalf of our entire staff, we thank you for choosing to stay with us and we hope you will give us a chance to serve you again. "STAY AWAY! MANAGEMENT NEEDS A CLASS ON CUSTOMER SERVICE." The rooms are worse than the room at a MOTEL 6. The microwave was old and stained. There was no soap to use in sink. They provided you with a "makeup wipe". The bathtub was dirty and the bathroom smelled of urine. The beds were old and you caved in because they were worn out. This Best Western should be called a Motel and shouldn't even receive a star. I am so sorry to hear that your most recent stay with us did not meet your expectations. Our primary goal is to provide all guests with an enjoyable experience and it is troubling to know that you faced such a usual experience. We take this quite seriously and have shared your feedback with management so that appropriate steps can be taken. Thank you again for taking the time for sharing this experience and for your valuable business. Right next to the freeway felt like you were sleeping right on the freeway, then around 2:00 in the morning they started trimming trees with a very loud noisy machine!!! Ugh!!! Horrible! Will never stay there again! We are continuously improving upon our services and accommodations and want to thank you very much for your comments about our hotel. We hope to see you again in the future. "Bug bites and rude people"
Broken lamps, empty conditioner dispenser, 16 bad bug bites, and rude desk help at check in. Couldn't say a word before man at desk was demanding credit card. Spoke over us every time we tried to ask a question or even respond to him. If reservation could have been cancelled I would have done it right then. Middle of night brother woke up with 7 bug bites in a straight line on his right forearm, 6 on his left arm, 2 on his upper thigh, and 1 on his chest. Probably a spider. If you get a room on the freeway side expect to hear trucks and motorcycles all night long. I am very sorry to hear that you experienced such an unusual circumstance and inconvenience during your most recent stay with us. We would like you to know that guest satisfaction is of extreme importance to us and your feedback has been forwarded to management. We truly thank you again for sharing your feedback and for your valuable business. "Friendly Staff and nice rooms"
The staff at the hotel is very friendly. My stay was filled with hellos and smiles from front desk, housekeepers and even the maintenance man. He was actually a little chatty but still very friendly. The rooms were also nice, clean and spacious. I plan to be back for sure. Thank you for your review and comments regarding our staff and housekeepers. Thank you for choosing our hotel. We appreciate your business and hope to see you again soon. "Poor Service with terrible management"
Staff was rude and manager condemned guests with sayings about God will not reward us for being bad guests. No Late Checkouts, even for 10 minutes. Greed and bottom line driven. Poor breakfast. Do Not Recommend. Thank you for bringing to our attention your experience and comments regarding your stay in our hotel. We take this very seriously and are very sorry about the issues you faced; this has been forwarded to management. Thank you again for sharing and we hope to earn your business in the future by continuing to evolve and improve guest experience. "Diamond Bar off of freeway"
The hotel staff were very nice and helpful, however the location is right off of the freeway. The hotel is older, and although they've updated some things, it's obvious that it's an older hotel. Room was in the back, and across the parking lot is the freeway. A bit noisy for light sleepers. We appreciate the comments, especially with regards to your opinion of our staff and location. Please do come see us again. I reserved 2 rooms under my name, I arrived early but my friend arrived 1:30 am. When she got to the hotel, she was told that the computer was down. Having the reservation number, they did not provided a room for her. She had to go and look for a hotel room at 2:30 in the morning!!!!!!! bellam0rena, Thank you for bringing to our attention your experience and comments regarding your stay in our hotel. This review has been forwarded to the management for further investigation. Please reach out to the general manager so that we can better address this concerns. I hope you will forgive this error and the service that did not meet your expectations and that you will someday return to see how we have grown through guest feedback. Room was comfortable and clean and a lot bigger than I had expected. Hotel is located right across the street from a grocery store which was very fortunate because the breakfast was not worth speaking of. We stuck to the oatmeal. I was pretty disappointed about that because I've stayed at several Best Westerns and always had a good experience with the food. My main pet peeve is when the heater or A/C is loud or too close to the bed and blows right in your face but this hotel has an exceptionally nice system. We only used the heat but it worked great and I didn't even notice it was on. All in all a nice hotel. Your review and rating of our hotel mean a lot to us, and we thank you for taking the time to share this experience. We strive to give you a great experience, and I am pleased to learn that we were able to meet your expectations in many ways; though I regret to hear that you weren't thoroughly impressed with our air conditioner and breakfast. We appreciate your rating and are very glad that this annoyance didn't detract too much from your overall experience with us. We are working to take care of all of the issues that you addressed and we thank you for taking the time to share your experience. "Many little annoyances and one major issue"
I recently stayed here for 10-night stay on business and was incredibly disappointed with both the quality and upkeep of the hotel as well as the front desk and manager. I have not stayed at many Best Westerns before but have Marriott Preferred Gold status and did a status match before checking in and gained Diamond Select status. On check-in my status was not recognized. I was not offered or told about the bonus points and I was most definitely not offered an upgrade, which as the highest status available should have happened. In fact, not only did I not get an upgrade I was given a connecting room (Room 103), which has to be one of the worst rooms available. Throughout my stay there were several minor annoyances and one major one that has put me off this hotel and truthfully, the brand. On my second night the smoke detector went off at 1am indicating low battery and the toilet constantly ran every few minutes. When I switched rooms the toilet seat would not stay up in the other room and the blankets were thin and not at all cozy or warm. While they offered laundry on-site for guests ($2 to wash/$2 to dry) they only carried $2-3 worth of quarters at the front desk. Why? How does that make sense in any way? Shampoo and conditioner in the shower were never refilled. The major issue happened on my 5th night. An elderly couple moved into the room next door. From midnight until the next morning I was kept awake by shouts and noises. I thought it was a kid in the room but it turned out to be the wife who had food poisoning. I made repeated calls to the front desk to help resolve the noise issue and even knocked on the walls and their door myself to no avail. In the morning I went to the front desk and the agent who was the one I spoke to and called all night simply said he tried calling that room but they didn't answer. So there was no attempt by him to resolve the issue. I then asked him to move them or move me to another room. He claimed he couldn't do anything until the manager came in an hour later. I went back the front desk and spoke to the manager. I asked to be moved and he claimed he had no other rooms but he would speak to the people next door. Later as I was getting ready for work the manager knocked on my door with the guest from next door to explain the situation. Why? Why would I want to meet them? The manager explained the wife had food poisoning and that was the noise and it wasn't anybody's fault. I couldn't wrap my head around this explanation. I understand she was ill but they completely ignored all attempts to help and I was kept wake all night. I spoke to the manager again and asked to be moved and he still claimed he had no other rooms. After repeatedly questioning him he finally relented and offered to move me after arguing with him for more than half an hour. Eventually he ended up moving me to a suite. Which should have been done on the first day at check-in. Once I was moved the rest of my stay was fine and the housekeeping and grounds staff are very nice and pleasant but the management of this place is sketchy. After being moved to the Executive Wing I noticed that the manager/owner I had been dealing with apparently also lives in the hotel with his family in what's called the Baron Suite. I saw them in there every day. I don't know if this is regular practice but it infuriated me that he was on-site the entire time I was having issues and complaining but would not step in to assist a customer if it wasn't convenient for him. Luckily, I've already spoken to my company about my experience and they're more than happy for me to stay at a more expensive hotel next time to avoid this place. speedracer211, Thank you for sharing the details about your recent visit. We appreciate you taking the time to share this experience and we do apologize for the inconvenience this might have caused you. Our main goal is to serve our guests above and beyond and satisfy them during their stay but it is saddening to learn that your expectations weren't met. You are welcome to contact us at the Hotel, should you have any other concerns about your stay. We hope that you would consider us again in the future so we may change your views about our hotel and management. Rosann D, Thank you for sharing your experience, and I am very sorry for the inconveniences that you encountered during your stay. We appreciate you taking the time to share this experience and we do apologize for the inconvenience this might have caused you. Our main goal is to serve our guests above and beyond and satisfy them during their stay but it is saddening to learn that your expectations weren't met. You are welcome to contact us at the Hotel, should you have any other concerns about your stay. We hope that you would consider us again in the future so we may change your views about our hotel and management. Locked in a rate for a baseball tournament and the front desk states that for every additional people would be charged $10 a person. I had an 11 year old and 4 year old. Front desk rude. Do not go here. They only care about the bottom line. doyadomari, Thank you for bringing to our attention your experience and comments regarding your stay in our hotel. We are very sorry to hear the unprofessional act of our Front desk clerk. We already informed the management about this for necessary actions. We value our customers well and we apologize for mistake of the clerk. We assure you that this is not to happen again. On behalf of our entire staff, we thank you for your business and we hope to see you again. "Get away from the crowd!" Very beautiful setting, rooms are quiet. We did have problems with the heater in our room and never could find ice in the machines. Breakfast was adequate. A good place to stay if you are taking the family to theme parks. We are continuously improving upon our services and accommodations and want to thank you very much for your comments about our breakfast and room. Know that your voice is very important to us and we will continue to reach for ways to improve guest experience in all areas. "Nothing Works, Vagrant Area, DO NOT STAY HERE"
First, staff is amazing. Very kind and helpful, but somethings they just can't really handle due to poor overall property management. Rooms are DATED. HVAC doesn't work at all. Muggy, nasty, uncomfortable the night we stayed (we left to another hotel). TV's don't work and make LOUD high-pitched noises when on (should have been replaced years ago). Refrigerators don't work (specifically the freezer, late night ice cream was more of a milkshake). Beds are scratchy and make you feel as though you're sleeping in a bed with mites. Lastly, the place attracts the kind of people a place like this attracts. Loud, low-class people. Once we where there (visiting family and business) we where then informed of it's local reputation for being a drug spot. We moved immediately the next day. I'm pressing for a refund. Thank you for taking the time to share your comments regarding our staff and bed. Your feedback will help us to grow and evolve and I thank you again for taking the time to rate your experience. Your voice is very important to us and we are continuously striving to improve upon the guest experience. Thank you for rating your stay and providing us insights regarding our room. I do hope you'll return so that we can surpass your expectations of service and accommodations. Would not stay here again unless I had to. They make you feel like you're checking into a motel 6. They give you vouchers for breakfast and they will not let you in without them. Rooms are clean just like a BW. Guest satisfaction is top priority at our hotel. For that reason we truly appreciate your comments regarding our breakfast. We hope to someday see you again to enjoy our Hotel and hospitality. "it was as if they didn't want business"
Thank you for your review and comments regarding our room. Please consider staying with us again so that we can have the opportunity to provide you with an even superior experience. Stayed there for 7 nights. Location is not on the main road but very near the freeway exit. Rooms are very spacious. Housekeeping cleans everyday except changing sheets which you need to tell them. Pillows provided were very small and uncomfortable. I don't know why they use those small throw pillows! I even had a stiff neck because of them. Complimentary breakfast was continental, they didn't even change the style of cooking eggs and potatoes, the whole time i was there! Only scrambled eggs and fried potatoes the entire week. Staff were approachable and friendly. Thank you for your review and comments regarding our staff and housekeeping. We appreciate you taking the time to share your experience. We were please to find such a nice place so close our business appointments. The room was very clean and very spacious. Unfortunately we didn't plan enough time in our travel that we could enjoy the beautiful pool. All of the staff we encountered were very professional and helpful. Brett B, Thank you for taking the time to let us know how you enjoyed your stay of Best Western Diamond Bar Hotel & Suites Hotel. I am so glad that you found our hotel to be clean and convenient and that you enjoyed the five star accommodations and hospitality that we strive to show to each guest, during every stay. We're glad you had a great time with us and we look forward to serving you again. Manuel H, Thank you for taking the time to share your feedback. We apologize to know that you were not satisfied with the breakfast and internet during your stay. Also, we are sorry for the disappointing service you received from our staff at that time. Our team is working hard to make sure our guests are comfortable and are receiving the best service. Your feedback will be forwarded to the hotel management to ensure that situation like this will not happen again in the future. We had a wonderful experience at this hotel. Our bed was extremely comfortable. It was a very quiet room and very clean. I would stay here again! Staff were organized and efficient. Nice place to stay! tafianneg2017, Thank you for your compliments to our staff and high standards of cleanliness and hospitality. We seek to give each guest a very comfortable and accommodating experience and we are thrilled to hear of our success in this ambition. We're glad you had a great time with us and we hope that your next visit will be another five star experience. I stayed at this hotel one night. The room had an odor, as did the bedding. The carpet was not clean at all. The heater vibrated and was quite loud, making it impossible to sleep while it was running. The rooms could definitely use some updating. The breakfast was not very good (stale bagels, limited selection of items). I wouldn't stay at this hotel again. sharone194, Your review and rating of our hotel mean a lot to us, and we thank you for taking the time to share this experience. We are sorry to hear that you were not satisfied with the condition and cleanliness of the hotel your guest room at that time. This is certainly not the kind of experience we would like for our valued guests to have. We are working to take care of all of the issues that you addressed and we thank you for taking the time to share your experience. Although the hotel is near the freeway, we heard no noise that bothered us at all. The room was big, and the bed was very comfortable. We would return to this hotel if in the area. The breakfast was very nice, and it is a safe neighborhood. WaltGlobal, Thank you so much for your feedback and kind words regarding the five star service and accommodations that you received during your most recent stay with us! We seek to give each guest a very comfortable and accommodating experience and we are thrilled to hear of our success in this ambition. We're glad you had a good time with us and Our team will be waiting for your next return for another well-deserved break. 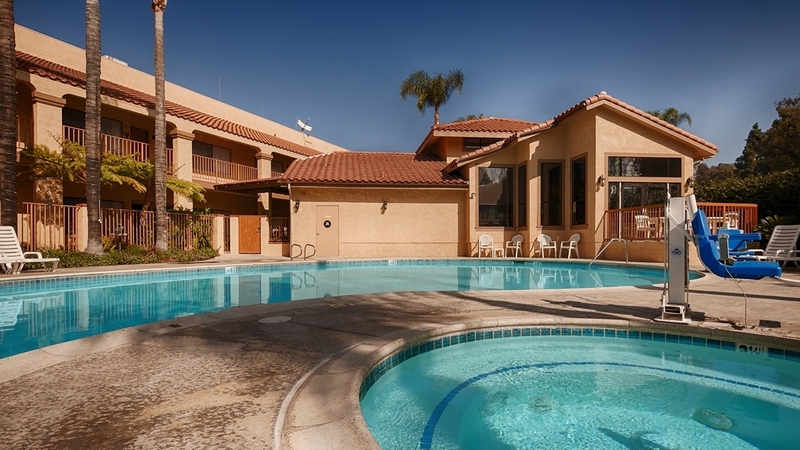 Very large rooms, lots of cable channels if you are a TV watcher, very nice outdoor pool and hot tub. Easy freeway access. Breakfast was okay but no meat items were offered. Pleasant place to stay when you are in the area. Dawn Ms, Thank you for letting us know how impressed you were with our services and amenities. Hearing about how our efforts to give you a pleasant and accommodating experience have been successful is very rewarding for every member of our staff and management team. We're glad you had a good time with us and Our team will be waiting for your next return for another well-deserved break. "Good if you're leaving early am." This is a reasonable hotel, convenient to the 57 and 60. It's close to the freeway, but freeway noise is not noticeable inside the room - even in the rooms at the back which are the closest. The room was big, moderately furnished, comfortable and clean. The issue for us was that breakfast closed at 0900. If you're coming in late (we were coming from an evening football game at the Rose Bowl) it means a short sleet if you want breakfast. Carolyn P, Thank you for your review, feedback and comments regarding your stay at the Best Western Diamond Bar Hotel & Suites. We are so glad to hear from you and to learn that we were able to give you a pleasant, comfortable and convenient experience. It has been our policy ever since to end our breakfast meal at 9AM, but for the good of our customers, we will be checking on possibilities in extending it longer than what we used to. We thank you for staying with us! I would stay here again, but not on the highway side, it's a little too noisy. The complimentary breakfast was very good, we chose to sit outside on the deck over looking the pool while we ate which was nice. kellyhI5664LS, Thank you so much for your compliments to our breakfast options and service. Our primary aim is to give you a comfortable and accommodating experience, and we are very pleased to hear of our success in this ambition. We're glad you had a good time with us and Our team will be waiting for your next return for another well-deserved break. Booked at a reasonable price but then upgraded to a low end suite to get into the room before 4 pm. Not really worth the extra bucks after viewing my sister's regular guest room. The exterior is nice and the pool area had ample seating. Housekeeping was outstanding. Those ladies were quick in turning over rooms. I did not like having my card charged upon arrival or the extra $100 they held until we checked out. Spent three nights at the hotel and the breakfast never varied from eggs, potatoes, hot/cold cereal, unidentified yogurt flavors, cantaloupe and do it yourself pancakes/waffles. Better than the nearby fast food options. Donnabello, I am so sorry for the inconvenience that you experienced because of this during your stay. The $100 deposit is for the incidental deposit which is 100% refundable to the guests if there are no damage/s is/are found on the amenities, electronics etc. in the room they stayed in. Refund will be put back to your credit card after 3-5 business days or depends on how fast your bank works. I sincerely apologized if this was not mentioned during your reservation, we will check booking procedure published online and update all information. Thank you for calling our attention for this matter and we hope to be serving you again. This is a very interesting hotel. The rooms are modestly furnished but large. The pool side is very much a resort setting. The breakfast setting overlooks the pool and palms. The prices are as good as I've seen for this class of hotel. Parking is free. If everything you need and a bargain price appeals to you, stay here. BTW, one side of the hotel faces a freeway. I don't know how noisy those rooms may be. Early B, I am happy to learn that you enjoyed the value and the amenities of our hotel! Hearing about how our efforts to give you a pleasant and accommodating experience have been successful is very rewarding for every member of our staff and management team.Thank you so much for your kind comments and Our team will be waiting for your next return for another well-deserved break. "Hotel was nice, room was okay"
The hotel was pleasant overall. The hotel room could have been a bit cleaner and i would have liked normal size pillows instead of half size ones. The ac worked really good. The internet speed was great. Television was good. The pool was nice except the hot tub overflows. 295reym, Thank you for letting us know how impressed you were with our services and amenities. Hearing about how our efforts to give you a pleasant and accommodating experience have been successful is very rewarding for every member of our staff and management team. We also appreciate your ideas for improving on our pillows, and we look forward to serving you again! We were arriving late into LAX en route to the Grand Canyon so picked a hotel around 45 mins from the airport. We arrived at the hotel 12.30 in the morning to be welcomed by a friendly guy who quickly checked us in. The room was bigger than expected. Everything worked well. If the breakfast had been better I may have given this hotel an excellent rating. Beware some construction work going on around the hotel so the good looking outside pool may not be attractive. AndyP1998, Thank you so much for your kind comments and review regarding your most recent stay at the Best Western Diamond Bar Hotel & Suites Hotel. We seek to give each guest a very comfortable and accommodating experience and we are thrilled to hear of our success in this ambition. We're glad you had a great time with us and we look forward to serving you again. well the place is very unprofessional.. I got there at 230 they told me room wasn't available and to come back at 3.. I went back at 3 got the room by a rude guy at the check in counter gave me the room.. room was not very clean or anything that from the pics.. its very noisy because its right by a busy freeway... breakfast was very simple with lots of things not stocked and fridge was locked?? yesterday at the time of checkout the girl check me out and said that she will email me my receipt.. why did they charge me extra $35 for another person in the room total of 3.. when I had booked thru hotels.com with double beds it said upto 4 people.. we were only 3 and I was charged extra. I will never stay with them ever again when I am in southern California.. the place is a fraud! Satpreet R, Thank you for sharing your experience, and I am so sorry to learn that we failed to meet your expectations of quality service and hospitality. Our entire staff works extremely hard to make sure all of our guests have an excellent stay, but it seems that we've not been able to satisfy you. We apologize for this and would love for you to contact me so we can figure this issue out together. I hope you will accept our sincerest apologies for these difficulties, and I thank you for bringing the matter to our attention. I have attended four high school reunions in the past fifteen years and this is where I have always chosen to stay. What a find; secluded, beautiful grounds and pool, large, clean, nicely decorated rooms, close to freeways and pleasant and helpful staff. It is always a pleasure to stay here. 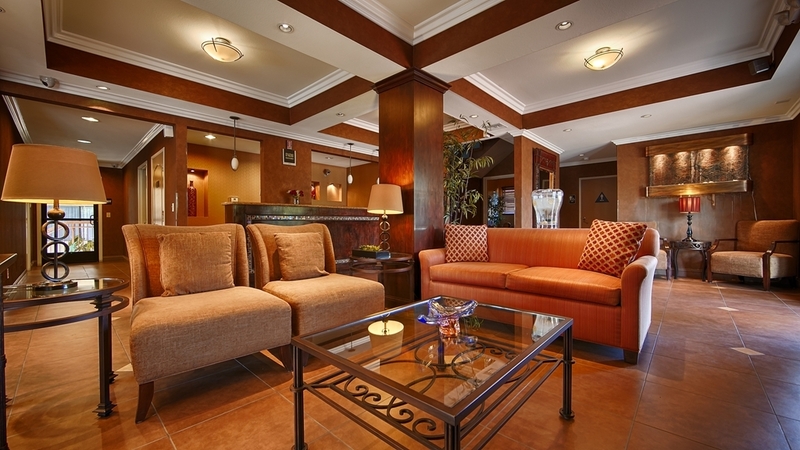 Ronda J, Thank you for leaving your five star rating of Best Western Diamond Bar Hotel & Suites hotel. I can't begin to express how much it means to our management and staff to hear from guests like yourself who have found our accommodations and services to be so welcoming and convenient throughout the years. On behalf of our entire staff, we thank you for your business and we hope to see you again. kennethsW2467HZ, Thank you for leaving your five star rating of our hotel. I can't begin to express how much it means to our management and staff to hear from guests like yourself who have found our accommodations and services to be so welcoming and convenient throughout the years. On behalf of our entire staff, we thank you for your business and we hope to see you again. I was in town on business and checked into the wrong city Best Western. I laid down for 20 minutes and was contacted by my office to inform me that I was at the wrong location. I then notified the front desk and asked for a refund so that I would be able to go to the right location. They refused to give me a refund. I was there 20 minutes! Dear 9416OXjeffreyc, Thank you for sharing your rating of our hotel. I am sorry that we were not able to take you a refund due to your lapse,The standard procedure in such cases is to confer with management regarding what can be done to resolve the error, as our staff is not authorized to make decisions which conflict with policy.We hope to see you again when your travels bring you back to the area! "Stayed here for an event at Pomona Fairgrounds"
Dear utpaatur007, Thank you for your review, feedback and comments regarding your stay. It is great to hear of how you enjoyed the breakfast and the convenient location of our hotel! However, I also want to apologize for the noises that disturbed your sleep, We wish you would have informed the front desk staff regarding this matter , as they would have gladly assigned you another room. We look forward to your next visit. stayed 4 nights in late July. Check in was quite slow. waited at least 15 mins even tho there wasnt any other customers apart from us in the line. We only had 2 rooms. It was great, diamond bar area has lots of Asian food. The hotel provided good wifi, has an elevator and even a pool. Breakfast selection was decent enough. Housekeeping only came first 2 days out of my 4 nights tho. which was abit weird to me but otherwise all was good. jasmynn, Thank you for letting us know how impressed you were with our services and amenities. I am so happy that you enjoyed your stay and that you found the accommodations and service to be satisfactory. We are overjoyed to hear that you had a great time with us and we are looking forward to your next visit! My wife and I found this place in a pinch and were very happy with our stay and the friendly staff here. Had a great night's sleep on a very comfortable king bed. The breakfast bar was well-stocked and tasty. (The eggs and potatoes must have been homemade they were so fresh and delicious.) They have a wonderful, spacious pool area that would be good for families. It is close to local freeways but not too noisy. Also close to some nice restaurants. Good deal. Dear Stephen M, Thank you for giving us the opportunity to recognize our staff for their exemplary work in providing a comfortable and convenient experience for our valued guests. I am also happy to learn that you enjoyed the value and the breakfast of our hotel! We look forward to welcoming you back during your next stay in the area. "Terrible - DO NOT STAY"
1. Room was not clean, 2. my son has allergies after staying this motel. 3. motel bed sheets cleanliness big ISSUE 4. Coffee glass was used, means the plastic bag wasn't cover on glasses. 5. Staff don't know what type of Bes Western customer am I? Dear 451amitkumarp, Please accept our sincerest apologies for the housekeeping issues that you encountered during your stay in our hotel. We thank you for taking the time to share your experience and we want to assure you that the housekeeping issues which you have brought to our attention are being addressed with renewed efforts to improve upon our policies to ensure that each guest has a pleasant and comfortable experience in the future. I was ready to give this place a bad review but I can't. One caveat - if you don't stay on the side away from the freeway (odd number rooms), you will need ear plugs. Check-in was a little slow - This doesn't seem to be the most technologically advanced place. However, the wi-f fi was fine, there was a smal refrigerator and a microwave. You can walk to a 7-11 or a Smart & Final (grocery store). Compared to other hotels in this price range, the room was very large. It had the same amount of furniture I am used to - desk, dresser with TV on top, small table and two chairs, but the room looked empty because it was large. The shower and toilet were in their own room and the sink was in another, which was fine for my wife and I, although I prefer an all in one bath when traveling alone. The closet had a door on it. Some in this price range don't. The BEST thing about this hotel was the A/C. most hotels in this price range have noisy A/C or if you open the window you hear the freeway. This was quiet, almost silent. Plenty of parking, easy freeway access. Free breakfast. Comfortable bed. Pool looked nice. Dear David B, Thank you so much for your kind comments and review regarding your most recent stay with us. We seek to give each guest a very comfortable and accommodating experience and we are thrilled to hear of our success in this ambition. We are overjoyed to hear that you had a good time with us and we are looking forward to your next visit! I have read the bad and the good reviews of this hotel. People complain about the breakfast, do they not read that is it free? Why would you expect a grandeur breakfast if it free? Sorry, I am sassy, bare with me. The rooms are huge, there is an elevator. I do wish that this hotel would have a better gym equipment, then again this is not best western plus or premier. The customer service is ok, not too great. The pool is big, the only problem I had was the housekeeping. Honestly, there are some good and bad qualities about this hotel, but you are going to get what you paid for. Don't expect something amazing if it is cheap. Just like buying something that is made in China. I know that people complained about the noise on the freeway side. Well, that is your fault. It is cheap for a reason. Pay a bit more for the better room, problem solved or stay at Motel 6 LOL. At any hotel, if you want to get the best experience, pay more. Nothing is free. I am being honest, everyone else is just opinionated and they think so highly of themselves. lol I paid more so that I would not be on the freeway side and my sleep was fabulous. Dear heatherspike1, Thank you so much for sharing your review and giving us an honest look at the guest experience in our hotel. We are all pleased to learn we were able to make you feel comfortable and that our services and accommodations lived up to your expectations. We are overjoyed to hear that you had a great time with us and We can't wait to give you another five star experience! "good value but you get what you pay for"
The hotel was nice and had a great pool. The rooms smelled like cat urine. Person who checked us in was very rude and not accommodating at all. I would say overall good for the price point but wouldnt go back b/c of the weird room smell. Dear ashleyk300, Thank you for taking the time to share your feedback. We apologize to know that you were not satisfied with the cleanliness of our room. Also, we are sorry for the disappointing service you received from our staff at that time. Our team is working hard to make sure our guests are comfortable and are receiving the best service. Your feedback will be forwarded to the hotel management to ensure that situation like this will not happen again in the future. "gives Best Western a bad name"
We reserved 3 occupants online (1 audlt, 2 children). Upon checking in, I showed the confirmation and the man at reception charged me for additional person $10.99 because, he says, my daughter turned 14 and is charged as adult (even though on the website kids r up to 17 ). At check out, my bill read additional $ 12.99. I asked and the lady said they included the tax with it but then the bottom line tax was based on all the line items so thats a double charge. The IRS should audit that branch. At breakfast, I asked where I can get drinking water. The lady (same one at check out) responds "there! pointing at coffee machine" while walking away. I clarified that I need cold not the hot and she just continued to walk away. She was doing reception at the same time as breakfast room. Their elevator was not working but the man who checked us in did not offer help. We got to breakfast hall before "end time" and there were still more that came after us but they had already ran out of warm food and I asked but they would not make more but no. We all settled for packaged muffins. Before the others were done, the lady turned off all the lights and said that the area is closed. I think that was rude and felt bad for other guests. I thought the location was convenient being off the freeway but its a bit noisy in the area so you couldnt really get rested. Also the room was not "conditioned" for guests to arrive. The tub had some hair so it wasnt cleaned at best. Dear angelicap811, Your review is greatly appreciated, though it is very disappointing to learn of the bad impression we made with the state of our accommodations. I am very displeased to hear that anyone was treated with rudeness or that any misunderstandings regarding your booking were not addressed in a professional manner. The standard procedure in such cases is to confer with management regarding what can be done to resolve the issue, as our staff is not authorized to make decisions which conflict with policy. Thank you so much for bringing this matter to our attention. The room was very large and clean. The bed was very comfortable. I would have liked it more if the hot tub would remain open past 9:00 pm. After a long day and dinner, there wasn't anytime to visit the hot tub. Dear F4007DJmargareta, We are so glad to know that you had a great time with us and thank you so much for appreciating our efforts of providing you with clean and comfortable accommodations . We would love to have you back and we do hope to see you again soon. Thank you so much for your compliments to our free shuttle service and have great day ahead. "Bad experience on Best Western Diamond Bar H & S"
I introduced my friends from China this hotel according to my experiences staying in other Best Western Hotel before and reserved two rooms for Jun. 1st to 2nd. But I experiences very bad treatment from the receptionist when we checked in. It's very bad attitude I received in this stay. It's horrible experiences in my life. Will not stay any more. Dear johnsonw631, I'm sorry to hear that your most recent stay with us did not meet your expectations of quality service, accommodations and hospitality. In regards to our receptionist I will address your concerns and make sure this behavior doesn't happen. Thank you for bringing this matter to our attention so that we can make sure no future guest experiences the same inconvenience. "Regular place to stay for many years"
Very accommodating and pleasant staff with comfortable rooms. This facility is always clean and attractive and a good value. We have stayed here nearly every month on regular trips to Los Angeles and have felt at home each time. Dear Margaret K, Thank you for giving us the opportunity to recognize our staff for their exemplary work in providing clean and comfortable experience for our valued guests. Our staff is highly trained to give you an exceptional experience, and to provide our customers the best we can offer in a reasonable price. We thank you for your loyalty and look forward to serving you again in the future! "Construction on elevator, midnight flooding sink"
To whom it may concern, This has by far been the worse best Western I've ever stayed at. Two story hotel with no elevator(well one that's under construction with no caution tape. please veiw attached video), with a 11 month old baby and they put us in a room upstairs. Not to mention while walking on the walkway upstairs it feels like you're going to fall through with all the soft spots. First night here our sink flooded while we were sleeping and soaked the floor by the bathroom door. So when I got up to pee with socks on in the middle of the night they got soaked. We complained to management before we left for the theme park. They did nothing about it while we were gone, the floor was still wet after we were gone all day and smelled disgusting. Do you know how hard it is to keep a 11 month old baby away from a wet floor? Housekeeping here didn't even take all the trash out. Everything I complained about to the manager she just shook her head and said okay. No apologies no let me fix this for you nothing. I'm appalled with her attitude and no customer service skills and can't believe I payed $100+ dollars a night for this. I will never be staying at a bestwestern again, nor will I be referring this awful place to anyone. Dear samanthafW3297HW, Thank you for completing our guest satisfaction survey and letting us know about your recent experience at our hotel. I assure you that each issue mentioned is being investigated and addressed and we thank you for taking the time to point out the areas where we can improve upon the guest experience. We hope to see you again in the future and to impress you with the improvements we've made. "Horrible do not stay here!" Worst customer service ever! Mayar (the manager or owner??) charged my charged my card 2xs and is refusing to credit it. Says it's my problem not his. Hung up on me when trying to ask for help. He charged illegally charged my card and is now refusing to fix it. Will be filing charges after numerous attempts to fix it. What a headache!!! Will never stay here again or a best western again!! Dear Karen L, Thank you for bringing to our attention your experience and comments regarding your stay in our hotel. I apologize that our staff were able to charged you double during your recent stay with us. I will discuss this concern to the management so they can assist with this thoroughly. Your satisfaction is important to us and we will be using the feedback you provided to make improvements to ensure we offer an exceptional experience . No one seems to know what they are doing. Our credit card was charged twice after we had paid cash. Manager will do nothing to correct their error. As of right now they have been paid 3 times for 1 room. He has hung up on us and says he will do nothing to help us. We have contacted Corporate for help. My advice is not to leave the property until you know for sure you have not been overcharged. We told manager about it at check out and he said he would handle it and credit our 2 charges. Now since we are thousands of miles away he won't do a thing. It may only be 200$$ for it's just not right. Dear Lavon P, Thank you for taking the time to complete our survey and share your experience! I apologize that our staff were able to charged you double during your recent stay with us. I will discuss this concern to the management so they can assist with this thoroughly. Your satisfaction is important to us and we will be using the feedback you provided to make improvements to ensure we offer an exceptional experience . On plus side, beds were comfortable. That's about it. On down side, any room on the highway side (were we were placed) is a HUGE noise problem...so loud outside you can't hear yourself talking, difficult to sleep inside. No real attention to detail or proper maintenance inside (mirror falling off the wall, paint, electrical, bulbs... Gym, such as it is, smelled badly...and was just a converted hotel room with very limited hours (8-9...making early or late workouts impossible). Breakfast was adequate. Staff not very customer friendly. Won't be back. Dear Michael W, Thank you for your review. We apologize for any inconvenience you experienced due to the noise level of the hotel. We strive hard to maintain a quiet and family friendly environment, but we can not control the actions of our guests. In the future, please speak with our front desk staff if there is too much noise, and we will gladly speak with the other guests, or move you to a more quiet section of the hotel. We hope to see you again soon. Arther, I'm sorry to hear that your most recent stay with us did not meet your expectations of quality service, accommodations and hospitality. Know that your voice is important to us and that we are addressing these issues to improve upon the guest experience at our hotel. We hope that you will change your mind about giving us a second chance and that you will someday return to be impressed by the changes we've made. Dear Anthony B, I am so happy to learn that you enjoyed our hospitality, service and accommodations. Hearing about how our efforts to give you a pleasant and accommodating experience have been successful is very rewarding for every member of our staff and management team. Thank you for sharing your 5 star rating! We will share your comments with our staff and we look forward to your next visit. Typical outdated best western property. Front desk person was professional but not very warm and didn't smile. I was not recognized as a best western diamond member. They charge a $100 deposit that is not stated on the website. The room was fairly large and had a separate sofa area. Sofa was rather hard to sit on. TV was large enough for the room and had some good tv channels including showtime. Bed was comfy enough but needs brand new fluffy pillows. bathroom was clean and of decent size. Shower handle didn't always function properly and leaked. Randomly at the times the bathroom lights would turn themselves on. Heat/ac unit was efficient and not noisy which was nice. Plenty of parking which was also nice. Hotel was pretty quiet and you could hardly hear other guests unless it's the morning when everyone is slamming doors and talking loudly outside. If you're on the first floor don't keep your window open alot because people like smoke in front of it and the smell will waft into your room. Carpet needs a nice deep shampoo. They are still doing renovations to the outside of property. Dear HotelGuruGirl, I am so sorry for the inconvenience that you experienced due to the $100 deposit is for the incidental deposit which is 100% refundable to the guests if there are no damage/s is/are found on the amenities, electronics etc. in the room they stayed in. Refund will be put back to your credit card after 3-5 business days or depends on how fast your bank works. I sincerely apologized if this was not mentioned during your reservation, we will check booking procedure published online and update all information. Thank you for calling our attention for this matter and we hope to be serving you again. Always clean and staff very accommodating. Lovely grounds and office and dining area attractive and clean. The free breakfast gives a nice variety of food, both hot and cold, and there is coffee available in the lobby all the time, which is a nice feature. Dear Margaret K, Thank you for your compliments to our staff hospitality and review regarding our high standards of cleanliness and breakfast layout. We seek to give each guest a very comfortable and accommodating experience and we are thrilled to hear of our success in this ambition. On behalf of our entire staff, we thank you for your business and we hope to see you again when your travels bring you back to the area! It's all about location, and for me this Best Western is in a great location. It's far enough away from Los Angeles to avoid the worst of the traffic congestion, but near to Anaheim and Ontario. The rooms are spacious and clean. It is near the intersection of two major freeways, so getting to your next destination is easier. If you love Asian food, Diamond Bar has plenty of choices for your palate. Dear Novoman, Thank you for taking the time to write this review in BEST WESTERN Diamond Bar Hotel & Suites Hotel and share your experience. It is heartwarming to hear of how our efforts to impress you with our cleanliness, comfort and convenience have been successful. We hope to impress you again during your next visit and we thank you for sharing your experience. Large pool and spa(beautiful at night). Rooms are large and spacious and landscaping is meticulously kept. Secluded and away from busy street. A nice retreat that is close to shopping and just a few miles from surrounding attractions. I highly recommend. Dear Ronda J, It's great to hear from you that you enjoyed the swimming pool, spa and found your visit to be a comfortable and we're so glad that you enjoyed a five star experience with us! We are also happy to hear that you found the location to be so convenient for your needs.Thank you for your recommendation, and we certainly hope that we can be of service to you and your family again on your next trip. "Would not stay at this hotel again." Experience was not pleasant because of overall appearance of hotel. Too many things broken in the room and poor customer relation of receptionist. Hotel is undergoing some remodel. It really needs a complete face lift. Dear Zaim K, We are sorry to hear that your stay & experience was unpleasant. We do our very best to ensure our rooms & equipment are thoroughly cleaned and maintained. Thank you for bringing this misstep to our attention, as it helps us to improve. We hope you will give us another chance should you return to the area. Even though this hotel was undergoing renovations, the staff made sure no one was inconvenienced by it. There was no excessive dust and the surroundings were clean. I always choose this specific hotel to stay when I or my family are in town because it is always clean and staff are always courteous. I just wish they's extend the breakfast to 10 am. Thank you so much for your kind comments and review regarding your most recent stay with us. I can't begin to express how much it means to our management and staff to hear from guests like yourself who have found our accommodations and services to be so welcoming and convenient throughout the years.We also appreciate your ideas for improving on our breakfast hour extend and we look forward to serving you again! This hotel has a close location to the Cal Poly Pomona Campus. We enjoyed the pool, Jacuzzi and breakfast. We do recommend better pillows because these were too large for our comfort. Next door is an authentic Chinese food restaurant which we tried and liked which was inexpensive. Thank you for taking the time to complete our guest satisfaction survey and for rating our hotel so highly! I'm especially glad that you enjoyed the swimming pool and found your visit to be a comfortable and pleasant experience. We look forward to seeing you again! This hotel is located in a quiet section in town. A nice Chinese restaurant is next door. 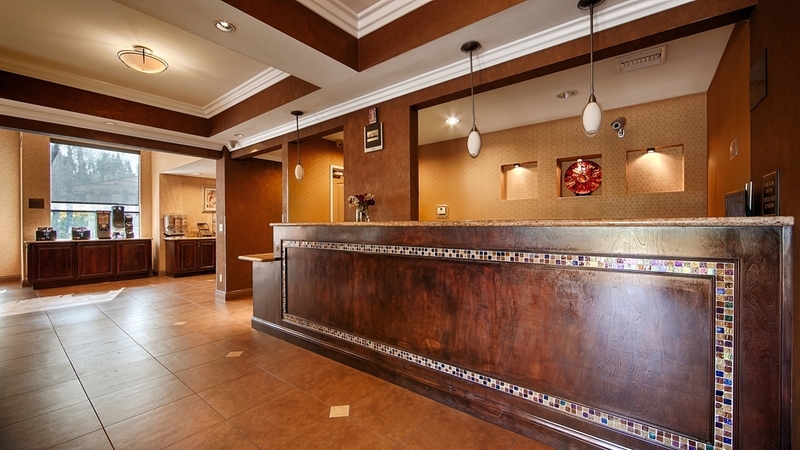 The rate is lower than any Best Western hotel in the vicinity areas and is consider to be very reasonable. The parking space in large. The only thing they can improve may be the internet speed. Thank you very much for the compliments you give to our hotel! We value our customer's experience that is why we always make sure that our facilities are in good shape to provide our customers the best we can offer in a reasonable price. We also appreciate your suggestions for improvement and look forward to impressing you during future stays. Had to come to Diamond Bar for a funeral so we only stayed one night. This was a beautiful setting and the room (223) was very spacious and very clean. Can't speak about the breakfast as we didn't partake. Even though the freeway is right next to it, it was relatively quiet. The only thing we found strange was that we secured the room with a credit card, yet when we checked in they asked for a deposit of $100. When we checked out, we received the cash back and the room was billed to the card. We have never experienced this at a best western in the past, which begs the question: what if we didn't have the cash at the time of check-in. Just a heads up for anybody reading this. Thank you very much for the compliments you give to our hotel! We are driven by the motivation of giving our guests the best service there is to offer, and it gives us great joy to know that we have done a good job in attending to your needs. It is distressing to hear that you encountered a number of issues and guest services and I want you to know that we take your comments very seriously and are working hard and fast to address these problems in hopes of improving upon the guest experience. Great room, Big , Clean and Comfortable. Plenty of places to eat close by. We enjoyed our night there very much. will use this Hotel again. Convenient to freeway access. Only inconvenience is Trip Adviser wants me to use 200 characters to make this review. "Cannot sleep due to noice"
The sound from high way traffic will not allow you to have a good sleep. We felt we are sleeping on a road due to the sound. Giving a 2 token system for breakfast sounds odd, and not professional. Especially when you have kids, buying additional break fast I would prefer to chose the mc-donalds next by. Thank you for this review of our hotel.I am very sorry for the disturbance that road sounds caused. We greatly appreciate your time in bringing a number of important matters to light and we hope that you will find your expectations to be far surpassed during your next stay with us. "OK but shower was a nightmare"
Shower went from freezing to scalding hot in an instant, constant adjusting of knob to find happy medium. WiFi slow during peak hours of 5 pm to 8 pm but worked. Staff had to twice reset room key, to work. Can get a bit noisy at night with people and young children walking back between pool and rooms. We very sorry to disappoint you that much. We already informed the management about this already as we see this a serious matter. We promise to be more careful soon as we believe that our customer's convenience are at the peak of our interest. In addition, we promise that these instances will never happen again. I hope you will still consider us for your stay again. I was very impressed with the kindness of the staff as well as the cleanliness of the hotel. The continental breakfast was a great way to start the morning. This trip was for business, however after a long days work we did make it to the hot tub. The pool and hot tub are very clean. I really enjoyed my stay at this hotel. My wife and I needed to attend a funeral located at Forest Lawn in Covina. The location of this property worked very well for us. Also, the low cost was helpful. The staff was very helpful and upbeat! It means a lot to us that you've taken the time to share this positive experience at our hotel. We seek to give each guest a very comfortable and accommodating experience and we are thrilled to hear of our success in this ambition. I can't begin to express how much it means to our management and staff to hear from guests like yourself who have found our accommodations and services to be so welcoming and convenient throughout the years. On behalf of our entire staff, we thank you for your business and we hope to see you again. Thank you for sharing this heartfelt review of our hospitality and accommodations.It is rewarding to hear that we have succeeded in making you feel at home. We look forward to serving you again! Hotel room had no hot water in room for 3 of the 4 days I stayed there. After taking a cold shower the first day, I talked to the manager and problem seemed to be resolved. 2nd day have hot water. Third day had, no how water, talked to manager and he said he would fix. 4th day no hot water. I am so sorry to learn that we failed to meet your expectations of quality service and accommodations. It is very important to us to address these sorts of issues right away and to ensure that you are able to enjoy the rest of your stay. I hope that you would accept our sincerest apologies about the inconvenience. Thank you for taking the time to bring this matter to our attention. We hope to serving you again soon and change the impressions we have made with our hotel and service. 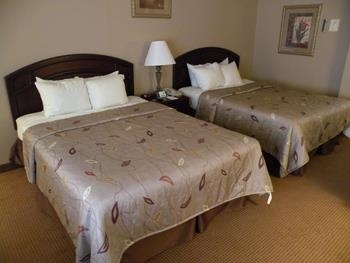 "Quiet and easy to get around"
I have stayed at this Best Western several times now and find it very quiet and clean. The property is located just off of 2 major freeways so it is easy to get to Anaheim or the Inland Empire from here. The rooms have been recently remodeled. All in all a good value. It means a lot to us that you've taken the time to share this positive experience at our hotel. I am so happy that you enjoyed your stay and that you found the location to be convenient and service to be satisfactory. Thank you for this review. We look forward to serving you again in the future! Thank you for giving us a five star rating! I am glad that you enjoyed your stay with us. We are happy to know that we have exceeded your expectations with our staff's excellent customer service, quiet environment, accessible location and ample parking spots. Thank you for staying with us and we are looking forward for your next visit in our facility. **DO NOT BOOK THIS HOTEL** Dirty room and full trash bags left in the room, also dirty pampers in the room, and what really pissed me off is that they told me breakfast was from 7 to 10 am. We got there at 9:30 and it was already closed, employees don't even know what the hell is going on. We sincerely apologize for the unsatisfactory experience that you had with the cleanliness of our accommodations. Thank you for bringing this up to our attention as we will have this looked into and resolve immediately. We hope that you can still give us another chance to prove how much we value your business. "Attractions Were Not Maintained - Disappointed"
The hotel room was clean and very lovely, however the pool and hot tub were not maintained. These were two things that initially attracted us to the hotel but we couldn't even go in because of how filthy the water was. Very disappointed. I am glad to know that you liked our accommodations. We sincerely apologize about the pool and hot tub, rest assured that this will be forwarded to our management to have them remind our staff of their duties. Thank you for your business and hope that you could still give us another chance on your next visit in the area. We stayed at this hotel as part of a wedding group in Oct end. The rooms are spacious and clean (option for King and 2 queens available).However please note there is no lift to reach the first floor so if you have large suitcases then suggest you ask for a ground floor room. We sincerely apologize that we didn't satisfied your needs. Thank you for feedback as this will be forwarded to our management to have them look into it and resolve immediately. We hope that you can still give us another chance to prove how much we value your business. 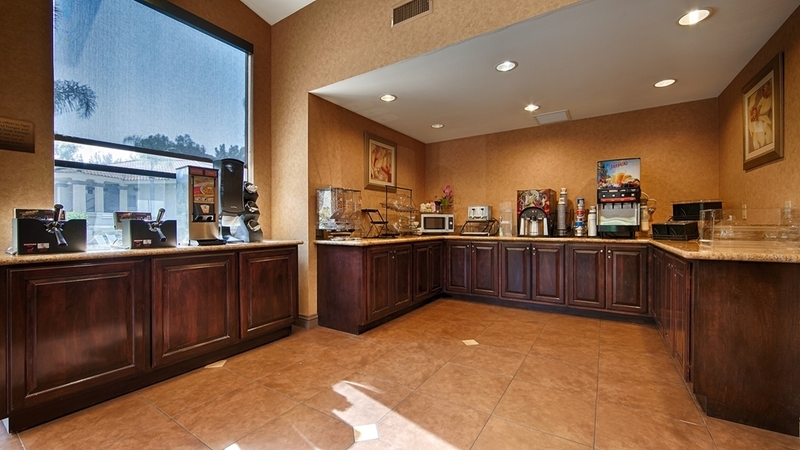 "Best Western Diamond Bar, CA"
Overall the hotel was good. Easy to find. Nearby shops and restaurants. Breakfast was great. Pillows were overstuffed and too hard for us resulting in stiff necks in the morning. We did not get a decent night's rest. I am glad that you enjoyed our accessible location and breakfast. We are very sorry that you didn't get a decent night's rest, rest assured that this will be forwarded to our management to have them look into it and resolve immediately. We hope you can still us give us another chance on your next trip in the area. I had a great time staying with a friend at the best western I was a little upset because I had to walk up stairs. There should have been an elevator. But I still enjoyed my stay except for the noise from the highway about 50 yards behind. I am glad that you enjoyed your stay with us. We sincerely apologize that we didn't have an elevator, thank you for your feedback as this will be forwarded to our management to have them look into it. We are looking forward for your next stay in our hotel. stayed here 5 nights ground level. only 1 nite of those 5 were quiet, the rest of the nites were filled with LOUD upstairs noise at random times. called once to complain, but that didn't seem to help much. i will not stay here again. We sincerely apologize for the unsatisfactory experience that you had in our hotel. Rest assured that this will be forwarded to our management to have resolve this immediately. Thank you for your business and hope that you can still give us another chance on your next visit in the area. Our room was very large. We found our two queen beds to be very comfortable. Everything was clean. The hot breakfast was minimal but sufficient. Everything was fresh and well maintained. Perfect for families or groups. I am glad that you enjoyed our accommodations. Thank you for your feedback regarding our breakfast, rest assured that everything you shared will be forwarded to our management to have them look into it. We are looking forward for your next visit in our hotel. We stayed here 2 nights we went to LA County Fair . It was conveniently located near freeway exit and by stores. The room was neat and clean. It had a nice sitting area. The bed was comfortable. The breakfast was nice they even had eggs, hash brown, biscuits with delicious gravy along with other choices. The staff was friendly. Nice flat screen television with cable that had a lot of channels. The room had a microwave and refrigerator. Amenities were fine; freeway noise was loud. Lighting issues need to be resolved. A good location for families; pool was nice and safe for children. The housekeeping staff were accommodating with our schedules.